The greatest Charity Race in the world is held in Athens for the 3rd consecutive year between 10 and 14th April, 2019, under the auspices of the NFL International and in collaboration with the Hermes 1877 sports & cultural club and the Stavros Niarchos Foundation Cultural Center. “NO FINISH LINE” is a Charity Race of 90 consecutive hours, where we run and walk for a noble cause. 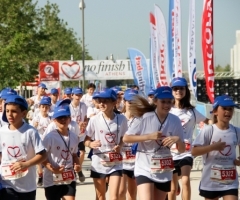 It is a race without time or distance limit, whose kilometres are turned into money, in order to support the work of “Together for Children”, an association of foundations and organisations in the field of child welfare. The race in Athens is part of the “No Finish International” international program and in the 2nd event that took place in 2018, 95,295 kilometres were covered by 10,178 participants, which, in comparison with 2017, shows increase of 82% in participation, 94% in kilometres and a rise in donations, that reached the impressive amount of 47,647.5 Euros! In the “NO FINISH LINE” race all the participants can either walk or run at any time of the day or the night they wish, for as many times and any days they want, in any way and rhythm and for as long as it pleases them, in the circular route of 1000m around the canal at the Stavros Niarchos Foundation Cultural Centre; in this way, they offer money by covering kilometres. The “NO FINISH LINE” Athens race is hosted for the third consecutive year in the Stavros Niarchos Foundation Cultural Centre, with commencement date of the race, Wednesday, April 10th, 2019 at 19:00 and termination after 90 consecutive hours, on Sunday, April 14th, 2019 at 13:00.